The Annual Santa series from Royal Copenhagen follow Santa Claus in his doings before Christmas and on Christmas night. Christmas Eve is a busy night for Santa when he travels around the world, yet he gives the impression of peace and harmony - he is never busy. In 2001, Royal Copenhagen launched a series of Annual Santas and since then the popularity of the series has grown enormously. 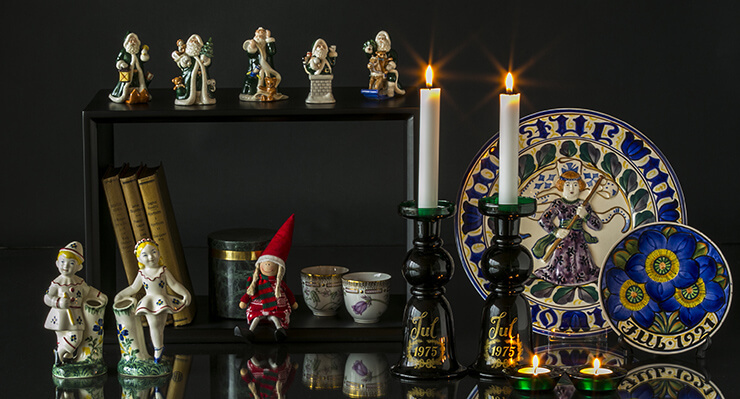 Gradually, the Royal Copenhagen figurine of Annual Santa achieved the same demand as the Christmas plate and especially the first edition from 2001 is difficult to find. Annual Santa 2001 was designed by Sven Vestergaard, who has also designed the following figurines in the series. The series is still in production and because of its resonable price, it is popular as Christmas gift to friends and family as well as to one self. Royal Copenhagen Father Christmas from 2001 to 2005 was in a period manufactured in green, primarily for the Italian market, but now they are also available in the Danish market. The green editions have made it possible for collectors who were not lucky enough to get the first red edition in 2001, to supplement their series, so they still can get the whole series. We know Santa Claus as red, but he is also beautiful with green jacket. The 2002 Royal Copenhagen Santa depicts Santa with various toys in his pocket. Teddy bears and dolls are jumping out of the pocket, while Santa has a great smile. You can see how he enjoys his job with bringing gifts to all children of the world. In 2003, the Annual Santa from Royal Copenhagen started to read a long wish list. With so many wishes, it's easy to find a gift, but sometimes difficult to satisfy all children. However, Santa Claus always makes an attempt, and in 2004 he is coming down through the chimney to a lucky boy or girl. Still we see that he has time to wave to by passers and he is full of joy. In 2005, we see Royal Copenhagen Annual Santa Claus sitting on a rocking horse - maybe he is trying his gift before delivery or maybe he's a big kid inside and just had to try the beautiful rocking horse. Santa Claus 2006 is seen with his trusty reindeer lying at his feet before going off with all the presents. Rudolf gets a nap before going off and so does Santa Claus 2007. He sits in his chair with gifts and toys around him. Also a Santa Claus may need a break and the Royal Copenhagen 2008 Santa is skating on the frozen lake with a teddy bear at his side. Royal Copenhagen Santa 2009 plays puppet teater for a curious dog and the Annual Santa 2010 shows Santa Claus feeding winter birds. "They also have to feel it's Christmas", as the famous Danish Christmas song "What a tremendous hustle and bustle" goes. In 2011 we see the Annual Santa together with a child sitting on his knee, telling him all the wishes for Christmas. Royal Copenhagen Annual Santa 2012 shows Santa in the living room of one of the families on his round. He will be greeted by the family dog who wants to play and happily bites his sock. The 2013 Santa is enjoying a well-earned rest and is listening to Christmas Carols from the old gramophone.